Offering you a complete choice of products which include unique model applicators, pillar set applicator and regular model applicators. 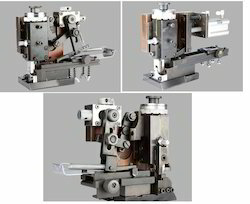 The unique model applicator with quick change system is made for crimping transversely chain form, individual terminals on wires with cross sections of wires. This applicator is designed with an indexed rotary head for reproducible, independent crimp height adjustment of both the wire and insulation. Sai paradise unique crimping applicators are used in the series production of the cable processing industry. Crimping applicators to connect wires and terminals in multiple applications made for bench top crimp machines and also as equipment for semi or fully automated systems. 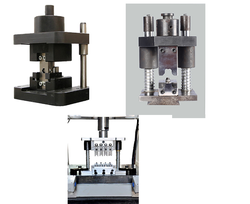 Our regular model mechanical and pneumatic feed applicator crimps in chain type (Reel form) terminals with wires of different cross sections. Its newly developed having great accessibility and easy adjustments; and the replacement of the spares are very much easy. Two different feeding cams are supplied - for manual (terminal already on the anvil) or automatic (terminal not yet on the anvil) set up. 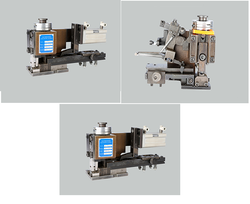 The applicators can be ordered either in side-feed or end-feed or mid-joint and individual or pneumatic based on the terminal manufacturing design and crimp height disk will vary to adjust the crimp height (0.1mm resolution, 1.0 mm range).